One of my favorite work to play uniforms involve pairing a printed shift dress with a classic blazer or jacket. It's the perfect way to get away with a little bit of edge and style while still looking professional at work. A boxy purse, minimal jewelry, and closed toe pumps seals the deal on a law abiding look. Once day turns into night, I'll strip off the jacket, add a statement necklace and kick off the daytime soles for soul breaking feet stunners. My legal pleading sized handbag is downsized for a clutch big enough to hold a few hours of nightlife. 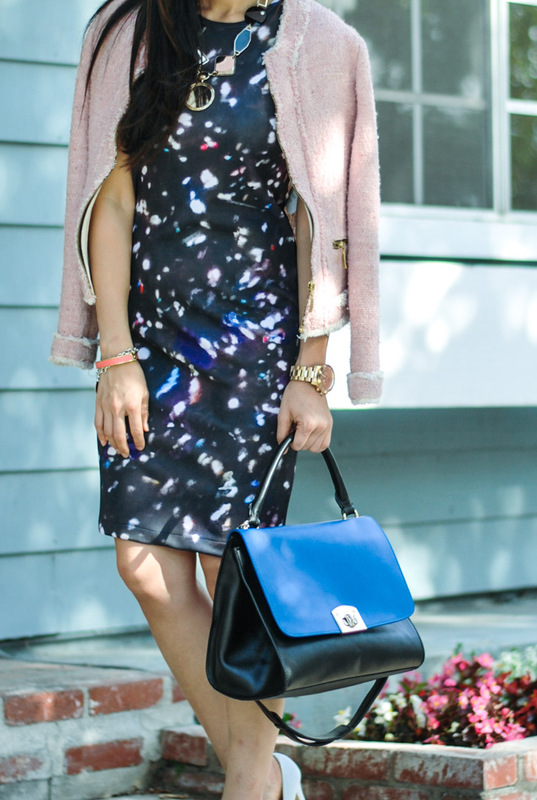 My cosmic print dress from Zamrie takes me back to my star gazing days. My parents love the outdoors and used to always take us on road trips to Yellowstone, Zion, Joshua's Tree, and the Sequoia National Parks. My favorite part of the trip was rolling down the backseat window, peeking my head out, and staring into the starry sky. It felt so peaceful to crash against the wind while gazing at the the infinite flickers of balls of hydrogen and helium. I saw it as a galactic metaphor for the infinite possibilities of life that hang above us ripe for the taking. Luuuurve that handbag! 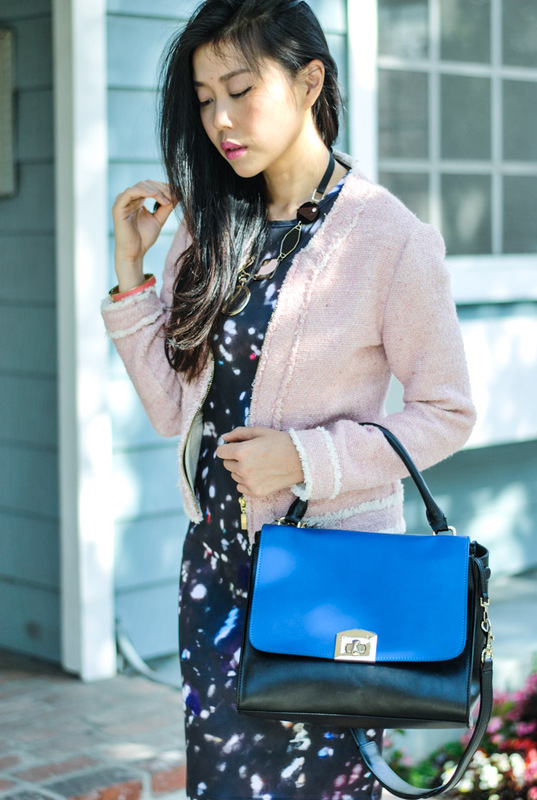 And love the cosmic theme on the dress! Gorgeous! Such a pretty dress and I LOVE the pink tweed jacket. SO chic! Great look - I adore that printed dress. So fun & eye-catching. GORGEOUS dress and overall look ! Gorgeous outfit. That bag is stunning! that dress is rad! love it!